Super stylish ski goggles from Smith. 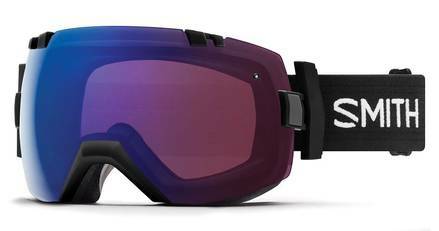 But style is not everything - with the I/OX Black goggles your get an immense wide field of view. That is due to the large spherical lens (a lens curved both horizontally and vertically) and the frameless design. If you want to shift your lens to another type the quick release lens change system makes it easy and effortless to do so. With these goggles come two lenses from Smith most advanced lens-series. The ChromaPop Photochromic Rose Flash and ChromaPop Sun Black lenses. The ChromPop technology gives you more detail over a wider range of light conditions. The Rose Flash cover light conditions from snowy to sunny days and the Sun Black lens is perfect for super sunny days. Included is a microfiber goggle bag with a replacement lens-sleeve. Product as described. Love the quality of Smith goggles.